Congratulations to the Storming Robots Team SR-chitect from Branchburg New Jersery, who alerted us that they have won the RoboCup Junior US Rescue B competition and will be travelling to the World Event in June. Thought you might want to know that our team won the US Rescue B and invited to compete at the World Event. We use 2 TIRs. A lot of work before June 18th! The RCJ Challenge demands high aptitude in abstract thinking, especially in programming the robot’s intelligence to handle variable elements on the game. It allows students to refine project outcomes over time with more sophisticated algorithms, and hardware improvement without performing similar routines every year. The team won First Place in the US competition using the Thermal Infrared Sensor. Congratulations to the team as they move on to the World Event in Mexico City this June! Enjoy Mexico! The Dexter Industries Thermal Infrared Sensor is helping teams win all over the world; see our previous entry about the Austrian RoboCup Junior Rescue Competition. 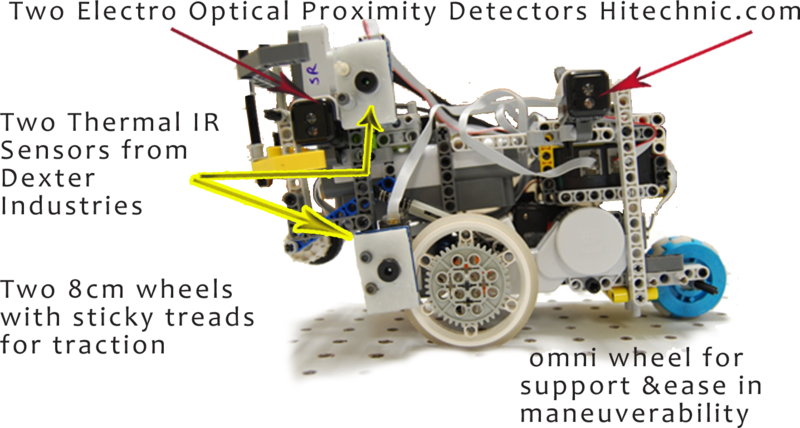 Announcing 2012 MoonBots A Google Lunar X PRIZE LEGO® MINDSTORMS® Challenge!